We estimate auto accident externalities (more specifically insurance externalities) using panel data on state-average insurance premiums and loss costs. Externalities appear to be substantial in traffic-dense states: in California, for example, we find that the increase in traffic density from a typical additional driver increases total state wide in-surance costs of other drivers by $1,725–$3,239 per year, depending on the model. High–traffic density states have large economically and statistically significant externalities in all specifications we check. 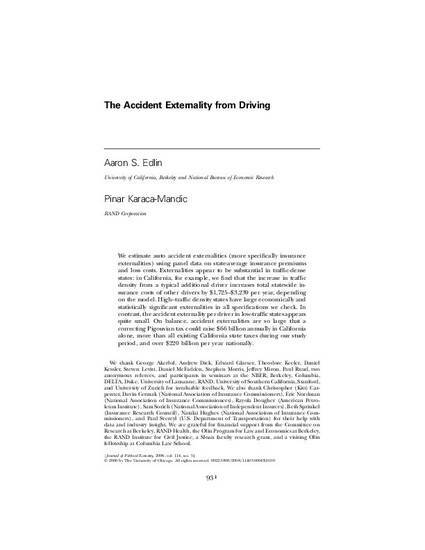 In contrast, the accident externality per driver in low-traffic states appears quite small. On balance, accident externalities are so large that a correcting Pigouvian tax could raise $66 billion annually in California alone, more than all existing California state taxes during our study period, and over $220 billion per year nationally.